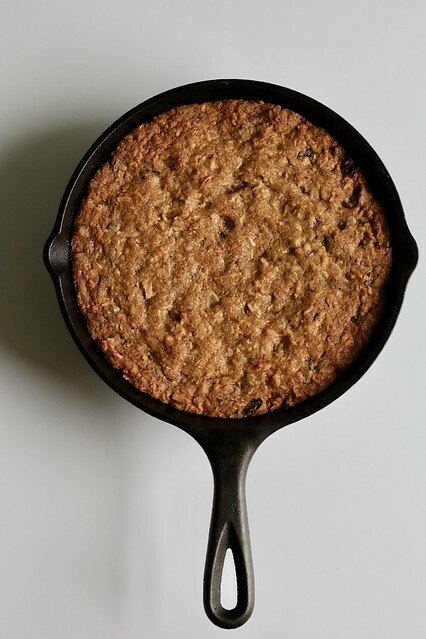 The Interwebs tell me that skillet cookies are a big thing. Certainly they are big cookies, which probably explains why I’ve never made one before. Cooking and baking for just two people, I usually go for treats smaller in size and quantity. 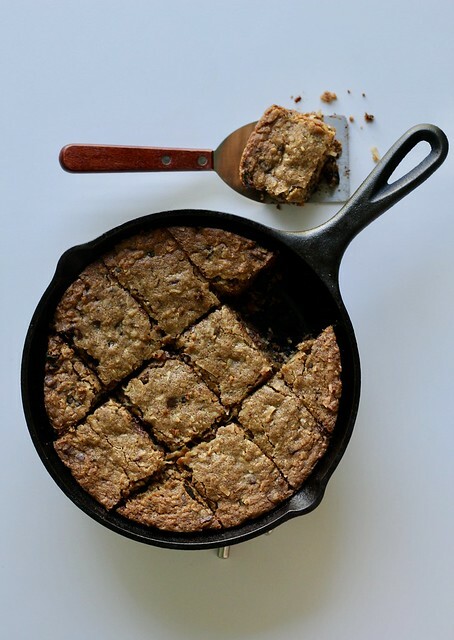 Luckily, I don’t think I’ll have a problem finding any takers for extra Cast-Iron Pan Chocolate Chip Cookie Bars. These are loaded with chopped chocolate (I used a milk and dark combo), dried fruit (I used cherries instead of apricots) and a ton of shedded coconut (I used half sweetened and half unsweetened). 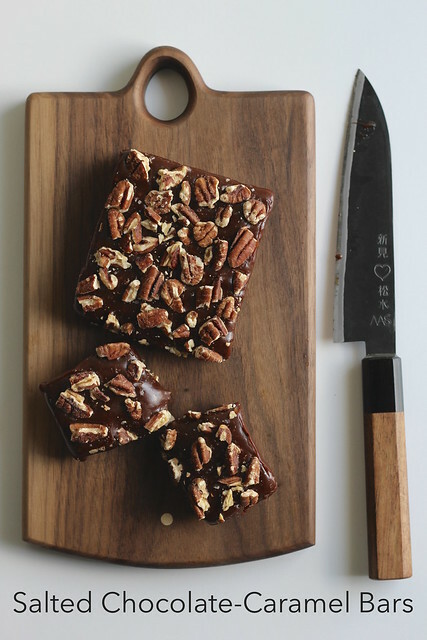 All that good stuff makes a sturdy, chewy, dense bar cookie…kind of like a trail bar, actually. Baking them in a skillet gives a nice caramelized bottom and edge bits. I do have a smaller-sized skillet that I use for things like frying eggs and I made a half-recipe of the bars in that. Those crispy edge bits are my favorite part, and I really like these bars with a scoop of vanilla ice cream. If the name of these bars doesn’t tell you everything you need to know about them, then the photos should. These Salted-Chocolate Caramel Bars are basically all that is good and gooey in this world in one cookie. 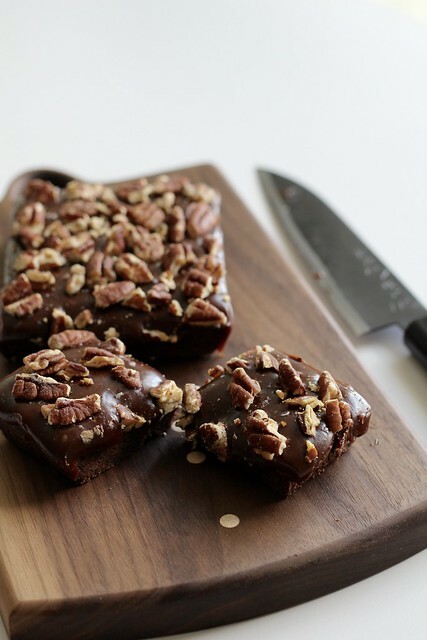 With a cocoa shortbread base, a layer of thick, salty chocolate-caramel sauce and toasted pecans on top, they are almost candy. If you’re in danger of eating too many, at least you’ll have no problem finding friends to share them with. My advice is to keep the bars in the fridge. The caramel layer gets a little schlumpy when they are left to sit for too long. They’re also delicious cold, if you can’t wait for them to come up to room temp. For the recipe, see Dorie’s Cookies by Dorie Greenspan. It was also Dorie’s #cookiesandkindness selection for the month of March, so you can find the bar recipe on her site, too. Don’t forget to check out the rest of the TWD Blogroll!